Hi there, friends! I got an exciting message from CreativeBug this week that I just had to share with you all. 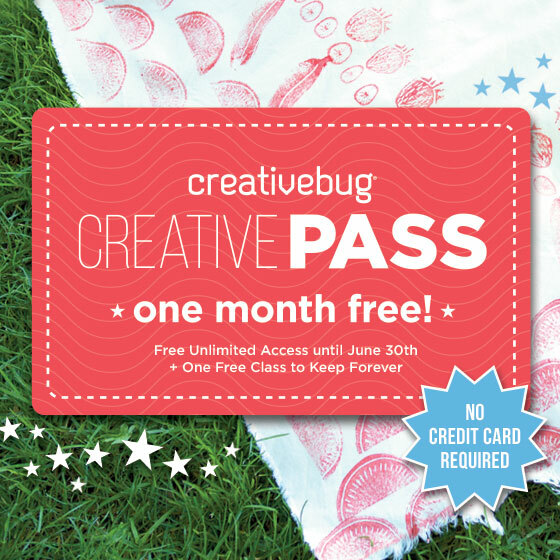 In celebration of the coming summer, they are offering a Creative Pass for the month of June! That means you get free, unlimited access to their classes until June 30th, and you can keep one free class FOREVER. Pretty snazzy, huh? Just enter code SUMMER2015 after clicking on the graphic below. Enjoy! This post contains affiliate links. If you decide to check out the Creative Pass or sign up for any classes at CreativeBug, I make a small commission on that referral/sale. We all like that, right? More $$ means more fabric. More fabric means more sewing. And that makes me reeeeeeeally happy! Got it? Cool! Let's talk diapers (and a free aromatherapy candle for you)! Okay. I know some of you guys have really strong feelings about sponsored posts. To be honest, I'm not a huge fan of them either unless they're a) super relevant to me, b) offering me (as the reader) something for free or c) are entertaining/informative in some way. I will try to cover all those points in this post. Got it? So let's get this out of the way: This is a sponsored post. If you click on a link and make a purchase, I stand to make a small commission on that sale. BUT, I promise to at least make this a little fun for all. Great. Moving on! Rewind to five years ago. I was pregnant with Harper, and like many first-time parents, I was already doing a *STELLAR* job at knowing all the things and judging all the parents. I've heard it said that we were all ideal parents BEFORE we actually became parents. Ahem, it's true. Our best intentions get blurred with busy schedules, changes in life circumstances, unexpected health problems, more children and...well...REALITY. With Harper, I spent months researching cloth diaper options, and I set up a little sewing station in the bedroom of our condo at which I sewed several dozen waterproof covers, pocket diapers and other diapering accessories. (Unfortunately, the pocket diapers I made - which took the most time and materials - ended up not fitting her properly. I didn't make anymore diapers after that; I bought everything!) I carefully chose prefolds to go inside the covers, and I had everything neatly laid-out and ready for when she made her appearance. When she was born, she wore a couple disposable diapers for the first few hours of her life, but after that, she was 99% cloth. The only time I remember putting her in disposables for about that first year was a long road trip to Montana. Our reasons for going with cloth were numerous. We anticipated having more than one child, so we knew we'd save money in the long-term if we used them several times. I also liked the idea of having more natural materials on my baby's delicate bum, and I loved that cloth diapers seemed easier on the environment. Convenience was also a part of it because in my head (at the time), I thought running down to the basement to wash some diapers sounded much easier than running to the store. In that first year, I caught the cloth diaper bug. You've seen the moms who have it - they love to collect new prints and styles, and they seem to take joy in washing and folding their baby's adorable little diapers. They call them "fluffy bums" and all kinds of other things. Yes, I was that mom. But then, when Harper was around a year old, she started walking. And eating solid food. And peeing/pooping in much larger quantities. And taking off her diaper. And waking up smelling like a monkey cage because she'd peed so much overnight. And I was pregnant. And vomiting. Life changed, as it does. I reluctantly bought a package of disposable diapers, and I guess I loved the convenience so much, I just never stopped. No more scraping poop into the toilet every night. No more worrying that guests could smell my day-old pee diapers in the laundry basket. No more stripping diapers that had hard water build-up from our Salt Lake City water. No more wet car seat from toddler-pee-quantity messes. No more feeling like *I* smelled like pee all the time from carrying around my wet toddler. Now, I know there are those among us who LOVE cloth diapering. And yes, some of the problems above could have been remedied by switching to a different type of cloth diapers or using disposable inserts or other things. With everything that was going on at the time though, disposables won. After a while, I got over my guilt for buying them and focused on pregnancy and having fun with Harper. Fast forward to now. BABY #3 IS DUE TOMORROW. YES TOMORROW. And I will have two boys in diapers at the same time. Harper has long been potty-trained, but Ezra, my second, is still in diapers at 22 months. I usually just buy whatever's cheapest and call it a day, and we've never had a problem with leaks except for sometimes at night. I've always thought about buying the (supposed) environmentally friendly and/or healthier options, but like I said...I usually just buy cheap since it works. But recently, I got an offer to promote The Honest Company diapers on my blog. I had seen their cute prints before and knew they were supposedly an environmentally friendly company, but I assumed their prices were out of my budget. So before I even started writing this post, I did a little cost comparison. The brands highlighted in red are ones that are MORE expensive The Honest Company's monthly bundle price. The ones in yellow are equal, and the ones in green are LESS than The Honest Company. You will notice that I only have one brand here - Earth's Best - that's labeled as environmentally friendly since my goal is to compare The Honest Company to what I would be paying normally (and I don't normally buy anything except the cheap stuff). Based on a limited review of pricing for diapers comparable to The Honest Company, there would not be any benefit to using another high-end brand. Using The Honest Company bundle will cost me about $25-30/month more than what I would pay for my current, cheapo brand. But, there's a significant benefit that must also be considered. Based on my research, I don't buy into the hype that mainstream disposable diapers are going to give my kids cancer or make my son infertile. However, I DO like supporting a company that mindfully manages its supply chain and strives to create a smaller footprint on the earth. I'm not going to re-post it all here, but you can read ALL about their health and sustainability practices and commitment to social responsibility. After reading those pages and doing a little research (yes, even some that is critical of diapers labeled as environmentally friendly), I decided to take the plunge and give them a try. Oh, and the offer of a free aromatherapy candle with first bundle purchase helped! I selected the size 1 monthly bundle for our new little guy who should be arriving any day now. For $79.95, I get 264 diapers and 288 biodegradable wipes delivered to my front door in a week. If I continue with the subscription, I will pay that same amount every month. And then, I happily tossed that free candle in the cart because...let's face it...every new mom can use a little aromatherapy now and then. Am I right? If you don't think so, you have obviously not spent much time around smelly babies! The Honest Company is offering a Mother's Day special to my readers, and I'm here to spread the word. When you order your first bundle of diapers, formula, household essentials or health and wellness products, you get a FREE Aromatic Soy Candle in the orange-cypress scent ($19.95 value). Get a free soy aromatic candle with your first bundle purchase on honest.com. Enter promocode CANDLE4MOM at checkout. Offer valid between 4/27/2015 - 5/10/2015 11:59pm PT. Offer only valid for first-time bundle customers on honest.com. So whatta you say we try these together? !